The 7 Best Places for Fried Chicken in Maine! When it comes to top-notch fried chicken, Maine can compete with the best of the best. With classic chicken shacks and restaurants serving up authentic, home-made tasting options with a special Maine twist, your taste buds will be thrilled. 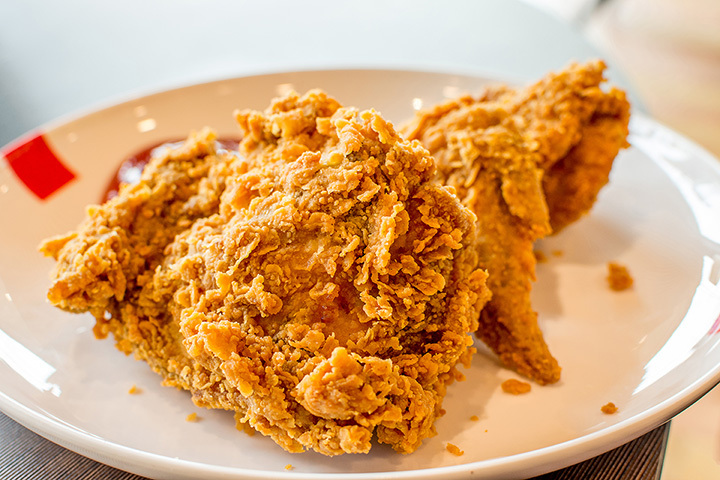 Here are the 10 best places for fried chicken in the state. Open Wednesday through Sunday in Portland’s new Thompson’s Point, Big J’s Chicken Shack is Portland’s hot new spot for fried chicken. The chicken is brined overnight and then soaked in buttermilk before being battered with the special house batter and spices. Choose from spicy options or traditional style. Figgy’s Takeout & Catering uses local Maine ingredients to create refined comfort food for people always on-the-go. The chicken is raised antibiotic and cage-free and the restaurant focuses on minimal waste. Choose from simply seasoned and floured skillet fried chicken or try the Korean-style wings. KP’s Place in Auburn is a bit of a hole-in-the-wall seafood joint, but they make some delicious fried chicken. The prices are super affordable and the staff are friendly. Instead of French fries, you can always upgrade to onion rings. Hot Suppa is a Southern-style restaurant in Portland serving up delicious comfort food with a unique Maine twist. The chicken is locally-sourced from Common Wealth Poultry in Gardiner and served during both lunch and dinner. Choose from fried chicken & buttermilk waffle, fried chicken & side, or Nashville hot chicken & side. Known mostly for their extensive oyster menu, Eventide Oyster Co. does serve something other than seafood on their menu. The buttermilk fried chicken bun comes with ranch, pickled watermelon, and coleslaw. Nicky’s Cruisin’ Diner is a Bangor landmark. Designed as a 50’s diner, you’ll find all the traditional diner and comfort food here, including several fried chicken options. Choose from chicken tender baskets or fried chicken sandwiches. The Red Barn has been a popular Augusta restaurant since 1977. As one of the largest and busiest family owned and operated restaurant in the area, the menu is large. Their boneless white chicken basket comes with French fries and a dinner roll and will fill you up.